Not everything, of course. But this 62k mile 04 reg S40 2.0d S looked like a good buy to me at £7,300. 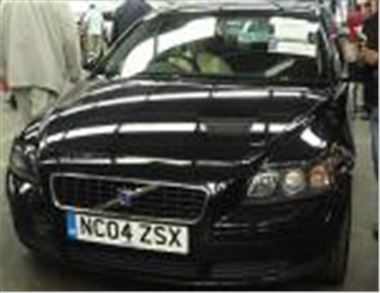 A 46k mile 05 V50 2.0d SE estate bid to a much stronger £10,500. A year old 6k mile Fiesta 1.25 Style 5-dr sold for £5,000, which is below the ten-year average for Fiestas of this spec and age. A pair of 06 Colt CZ1 5-drs, each with 8,500 miles sold for £4,700 each and a 6k mile 06 3-dr for £4,200. Leggy Honda Accord diesels are now sensible money for cars of better quality than contemporary MB C Class. BMW E90s aren’t so much any more. But prices paid for a par of 530ds would seem to indicate that maybe the bigger cars now have some RHD export potential. Finally, a word of warning. BCA has now got its parking back to normal at BCA Blackbushe, so from 16th July is re-introducing parking enforcement. There is plenty of room in the front carparks, so don’t stick it on a double yellow and run the risk of a £120 clamp release fee. Here’s the list. As usual, ‘s’ means sold. ‘p’ means top provisional bid, ‘n/s’ means not sold. ‘n/w’ means miles not warranted. ‘dmg’ means damaged. Prime Fleet, Citroen UK, Leaseplan, Black Horse, Lex, Bank of Scotland, General Section, Jardine p/x, Inchcape p/x, Snows p/x, Sytner p/x, Trident Honda p/x. LCVs from Leaseplan, Vauxhall leasing, Peugeot, Citroen, Northgate, Fleet Direct. Fleet & Finance, LTSB Autolease, Lex, Bank of Scotland, Motability, Masterlease, Hitachi Capital, Peugeot Motor Co., General Section, Inchcape p/x, Charters p/x, Private Sure Sell. Fleet Direct, Lex, Bank of Scotland, Inchcape Prestige, Porsche p/x, Mercedes Benz Retail p/x, Franchised Dealer p/x, Inchcape no reserve p/x, Evans Halshaw Group p/x, Pendragon p/x, General Section. Prime Fleet Hitachi Finance, Leaseplan, Black Horse, Lex, Bank of Scotland, General Section, Jardine p/x, Inchcape p/x, Renault Financial Services, Leaseplan, Sytner p/x, Snows Group p/x, Trident Honda p/x. Light Commercials from XBG, Dagenham Motors, Royal Mail, Lloyds TSB, Northgate, Fleet Direct. Fleet & Finance, LTSB Autolease, Motability, Lex, Masterlease, Vauxhall Leasing, General Section, Hitachi Capital, Charters p/x, Private Sure Sell, Inchcape p/x. Fleet Direct, Lex, Bank of Scotland, Inchcape Prestige p/x, Porsche Retail p/x, Mercedes Benz Retail p/x, TOP CAR, Franchised Dealer p/x, Inchcape no reserve p/x, Evans Halshaw p/x, Hartwells p/x, Pendragon p/x. Volvo Car UK Ltd., Prime Fleet, Leaseplan, Black Horse, Lex, Bank of Scotland, General Section, Jardine p/x, Sytner p/x, Inchcape p/x, Snows Group p/x, Trident Honda p/x. Light Commercials from Leaseplan, Vauxhall leasing, Peugeot, Fleet Direct, Citroen, Northgate, Non Runners . Fleet & Finance, LTSB Autolease, Motability, Lex, General Section, Citroen UK, Masterlease, Bank of Scotland, Hitachi Capital, Peugeot Motor Co., Charters p/x, Private Sure Sell, Inchcape p/x. Fleet & Finance, Lex, Bank of Scotland, Inchcape Prestige, Porsche Retail p/x, Mercedes Benz Retail p/x, Franchised Dealer, Inchcape No Reserve, Evans Halshaw p/x, Hartwells p/x, Pendragon p/x.